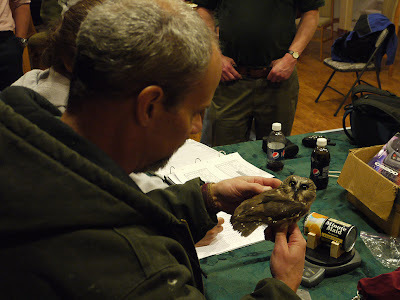 I’ve been to several bird banding stations over the years, but over the last few weeks I’ve finally seen owl banding in action. 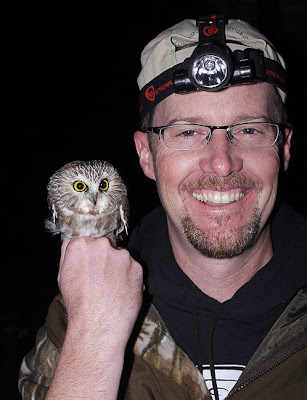 Master bander Scott Rashid traps migrating Northern Saw-whet Owls every fall near Estes Park, Colorado, and invited me to visit. The trick used by Saw-whet banders is to play a recording of their toots in the middle of a mist net array. Even though it isn’t breeding season and you wouldn’t expect migrants to be territorial, the little ‘Swets fly in to check out the noise and bop into the nets. 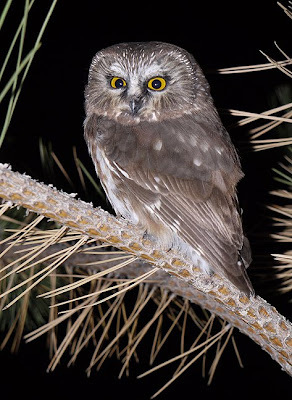 Interestingly, the owls usually are caught very near the ground, so apparently they are flying in just above the tops of the grasses as they investigate the sound. 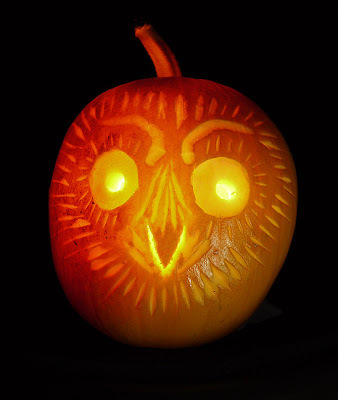 Once, Scott caught a Long-eared Owl- perhaps it was hoping to poach a wee Saw-whet? 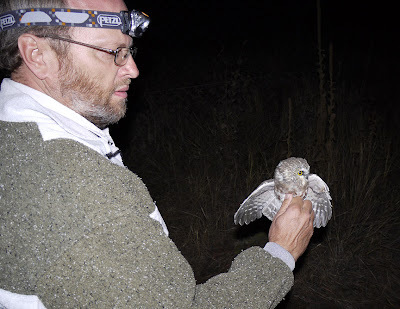 He also once caught a Northern Pygmy-Owl, and indeed we heard an annoyed Pygmy vocalizing nearby at dusk although it didn’t come in to the nets. 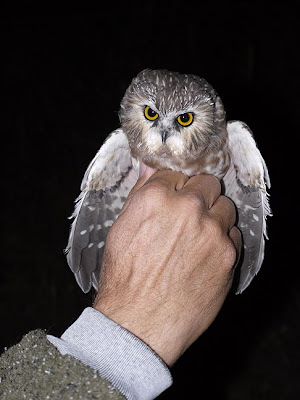 Saw-whets are really small- it is hard to imagine by seeing pictures of the owls alone, but in hand you really get a perspective of their diminutive nature. 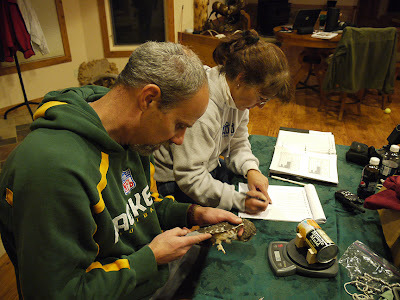 They are cavity nesters and so have to fit in woodpecker holes, after all. Little is known about their migration and wintering habits since they are generally silent and very secretive when they aren’t on breeding territories. The only wintering Saw-whets I’ve seen have been in dense junipers during the day, seemingly oblivious to the world around them. 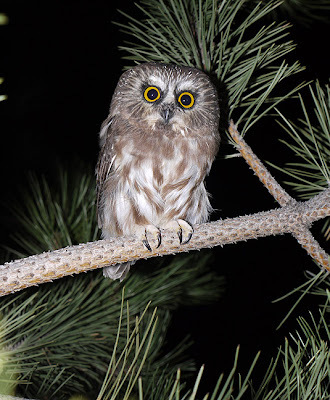 Another bander I know once climbed a ladder and hand-captured a migrating Saw-whet Owl by just picking it up off of its branch. 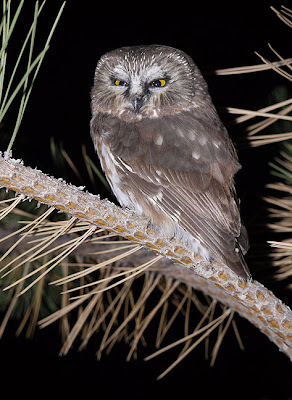 After measuring and banding it he returned it to the same branch where it spent the rest of the day before resuming its migration that night. Even a really plump female just approaches 100 grams- about 3.5 ounces for you fans of the imperial system of measurement. Most are only about as heavy as an American Robin. 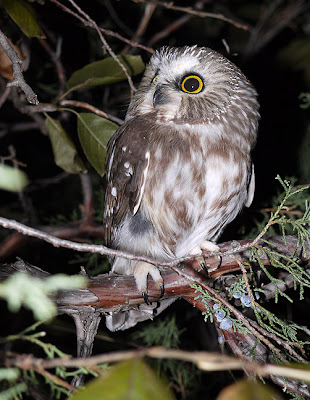 My favorite thing about the banding is that Saw-whets will often perch on a branch for quite a while after they are released- of the 4 birds we caught two flew away immediately but the other two loitered for quite a while (one for over an hour), allowing for some neat photography. All of my other Saw-whet pics are of uncaptured birds that I had to work pretty hard for but you’ve got to take the easy photo opps like these when they present themselves! I've updated my Digiscoping Tips and Tricks File in preparation for the class, but you can also click the link to get a PDF copy of it. While we're at it, I also have the 2009 Nikon digiscoping system brochure available as a PDF. I just got a loan of some great gear from Nikon- their FSB-U1 universal digiscoping adapter and a Coolpix P6000 camera along with the 20/25X Long Eye Relief eyepiece to put on my 65mm EDG Fieldscope. I'll blog about the rig soon and welcome any questions folks have about it. I'll also have the rig set up at the workshop for folks to check out in person. Another really exciting piece of gear that I can't wait to try out in the field is Nikon's FSA-L2 Digital SLR Adapter. It lets you connect a Nikon DSLR to an EDG scope, turning it into a super-telephoto zoom (750 - 2,625mm or 600 - 2,100mm on the 85mm and 65mm models, respectively, for most DSLRs. Full-frame DSLRs (like the D3X) yeild 500mm - 1,750mm or 400mm - 1,400mm on the 85mm and 65mm models, respectively.) I don't think it is quite on the US market yet but when it drops it is going to make some big ripples!! I have it ready to go and will be happy to show anyone how it works at the workshop and in a future blog post. I had the pleasure of birding at of my favorite places on Colorado's Eastern Plains yesterday, The Nature Conservancy's Fox Ranch. 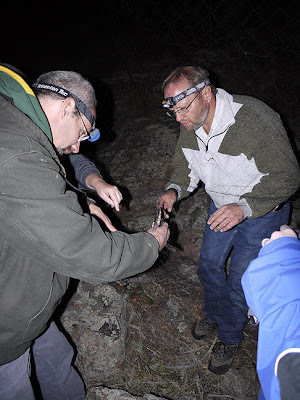 While this working ranch is closed to the public, Ted Floyd arranged for a small group of us to conduct a bird survey on the property yesterday. Click here for Ted's summary of our trip (including 6+ Le Conte's Sparrows, a staggering number for Colorado). 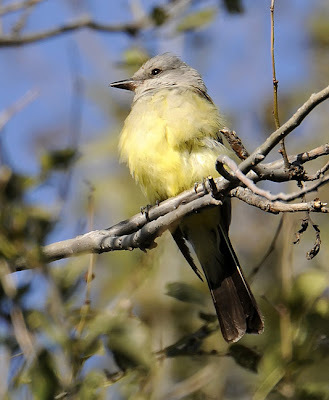 One of the many interesting birds we found was this kingbird. 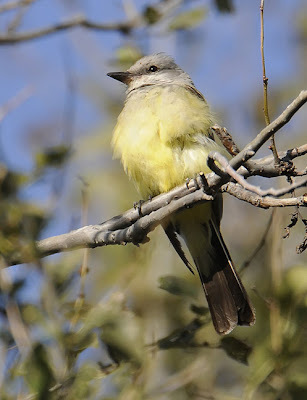 We are presuming it to be a Western Kingbird but given the late date (the bulk of Westerns clear out of CO by mid-September or so according to Colorado Birds by Robert Andrews and Robert Righter) and the similarity of a few other more southerly kingbird species, I thought I'd post a couple of pics of the bird so folks can have a gander and chime in on the ID if they feel so inclined. Unfortunately, this is the only angle of the bird that I have- no shots of the back or from the side which would be very informative.